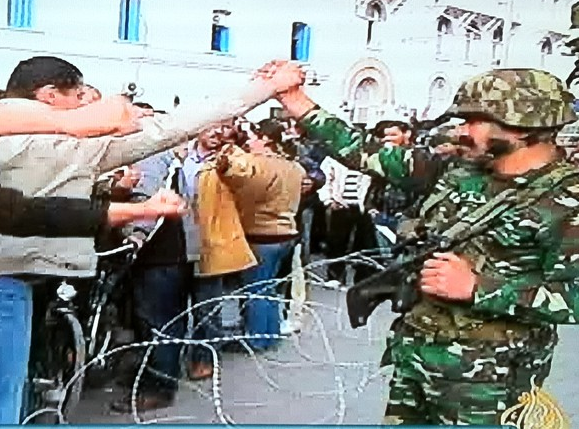 The elation felt across the Arab world over the Tunisian uprising is deep and palpable. It is not simply that, like most people, Arabs are pleased to see a long-repressed people finally have a shot at gaining their freedom. It is also that many recognise themselves in the Tunisian people and share their hopes, their fears, and also their guilt. These emotions came to a head last month when the space to finally criticize rampant corruption, cronyism and unemployment was created by the tragic self-immolation of a young street vendor named Mohamed Bou’aziz. By causing physical harm to no one but himself, Bou’aziz managed to garner sympathy for the pro-democracy cause and create space for actual nonviolent resistance in a region more typically marred by suicide bombings. While the protests were initially spontaneous and likely without a grand strategic vision, there was a fair amount of tactical coordination involving the trade unions, influential bloggers and others in civil society, as well as extensive use of Facebook and other social media. The protests built gradually, starting with the suicide incident in the small city of Sidi Bouzid, then grew and moved to a few larger cities before, finally, throwing itself in front of governmental buildings in the capital. Using this “nonviolent blitzkrieg” and clever tactics such as “distract and dislocate”, protesters were able to match up against 100,000 armed forces, which was the approximate manpower of the government’s uniformed coercive pillars at the beginning of conflict. The protesters also showed tremendous unity, a key element in most nonviolent struggles. The students and youth who were alone when they started protesting unemployment, were soon backed by the lawyers, and then labor unions. Teachers and more youngsters got involved as soon as the government made the mistake to close the schools. So, the policy of small victories was there, building toward the announced general strike last Friday. 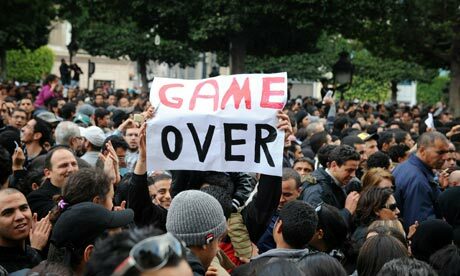 Although it never happened, it was a signal for president Ben Ali to make his last move: dissolve the government, call the army and lose the final game. Having discussed this with some of our friends and experts, I think despite the limited violence we can certainly count Tunisia as a candidate for another “victorious” unarmed insurrection. How victorious it will be, however, depends on future events—most of all the forthcoming elections scheduled by transitional authorities. On a certain level, however, Tunisians have already succeeded. As Popovic pointed out, they “faced down bullets and tear gas and overthrew a US-backed dictator” and did so without any third party involvement, due in large part to the instability of its neighbors and Western-ties to Ben Ali. First off, the regional environment is “shaky”, considering the immediate response to the Tunisian events by Algerian activists, the protests surrounding Egypt’s transition of power, the Sudanese referendum, and the latest unfortunate developments in Lebanon. Secondly, the “usual suspects”, namely western democracies led by the US and in this case partly France, were obviously caught off guard and definitely cannot be accused—as in the case of the “Color Revolutions”—of being behind these events. In fact, widespread opinion is that the US backed Ali for quite a long period, or at least did nothing to encourage his opponents. So, the Tunisian uprising is definitely authentic and homegrown. That is not to say, however, that the uprising is without its influences. According to Popovic, Tunisians used a slogan (“Yezzi fock”) that means “It’s enough”—similar to slogans used by democracy activists in Zimbabwe, Georgia and Sudan. This transferring of knowledge reminds Popovic of the youth democracy movement that emerged in Serbia, continued successfully through Georgia and Ukraine, and then unsuccessfully (but significantly) in a few other former Soviet countries. Could this mean we are seeing a resurrection of youth democracy movements, perhaps this time in the Arab world? It seems evident that activists from Egypt, Sudan and Tunisia are connected or at least learning from each other. 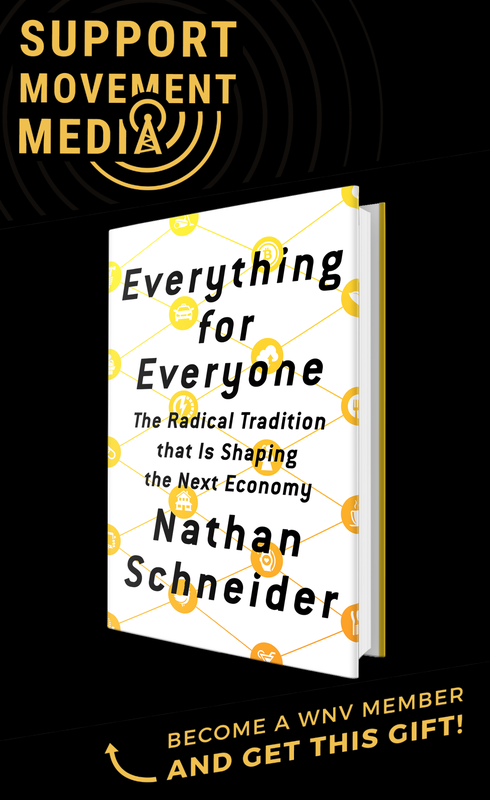 Not only are their movements looking alike regarding their manifestos, methodology, slogans and symbols, but they seem to communicate among themselves and efficiently support each other. Tunisia’s revolution, to become contagious, must be both peaceful and mark a real break. It must find the balance between punishing those who backed the Ben Ali regime and forgiveness for those who, in myriad ways, took part in a system that sometimes left them little choice. It must show that democracy and stability are not incompatible on Arab soil. It must boost the arguments made by the likes of the Egyptian opposition figure and Nobel laureate Mohamed ElBaradei that, on their current paths, many Arab regimes are heading towards an ugly dead end. 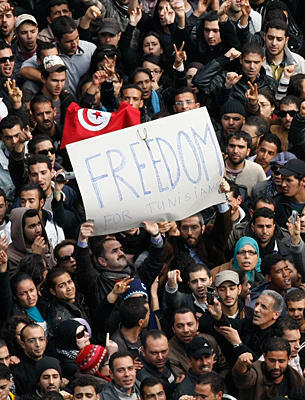 The Tunisian example may or may not inspire popular uprisings elsewhere. But it should send a loud and clear message to largely politically disengaged and complicit Arab elites that, if they do not start pushing for peaceful change now, what happened in Tunisia could happen in their country. The outcome, though, might be much uglier. Thanks Sam. Glad you pointed out the DN segment–definitely a great source for those wanting more analysis.